This past weekend I revisited Cranmore, the first lift-served ski area I ever skied. I skied there in the mid-1950s as part of the local school’s afternoon ski program. On the drive to North Conway, I was trying to recall the last time I had skied Cranmore. It probably was around 1980 since I do remember our kids being about ten and twelve. 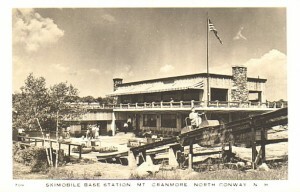 There have been a lot of changes at Cranmore since that last visit. The unique Skimobile no longer exists, having been retired in 1988. The old wooden base lodge has been replaced or maybe just completely redone. The Eating House is now Zip’s Pub although everyone of a certain age still refers to it as The Eating House! In the old days it took two Skimobile rides to get to get one person to the top. Now a high speed detachable quad whisks four skiers to the top making the mountain seem much smaller than I remembered. 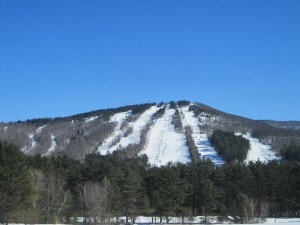 In fact Cranmore is a small mountain with only 1200 vertical feet. They squeeze 57 trails into that small mountain and many go from top-to-bottom so it’s not “trail name inflation”. While there are some new trails, the old trails are still there: Rattlesnake, Kandahar, Gibson, Ledges. All the non-gladed trails have snowmaking, but the area has resisted the trend of widening and straightening snowmaking trails. Most of their trails are still narrow and winding (think Toll Road). I expected to also find the mountain flatter than I remembered, but in fact the trails pleasantly surprised me. Sure, their black diamonds are much like Main Street, an intermediate trail with one steep pitch, but they were fun to ski. Another thing I remembered about Cranmore didn’t change – the good weather! Bright sun warmed the temperature to about 32 degrees which this winter felt like 80. The area faces southwest similar to Sunny Spruce and the summit elevation is only 2000 feet so the weather is less severe than higher elevation ski areas. By the afternoon the sunny surfaces were becoming soft and springlike. One other thing that hasn’t changed is that it is a family area. At lunch we sat with a family which had three generations present, all of whom learned or were learning to ski at Cranmore. What brought me back to Cranmore was the 19th annual Hannes Schneider Meister Cup. This event is a celebration of skiing history and brings together three “families” that had a great impact on skiing. First is the Hannes Schneider family. Hannes Schneider pioneered modern ski teaching techniques that spread throughout Europe and eventually the United States. 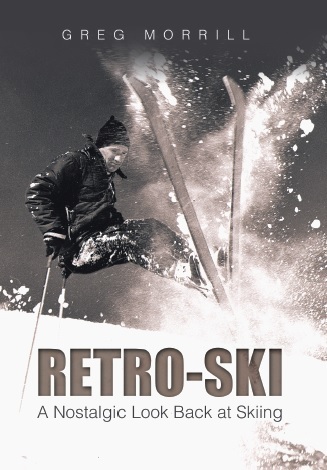 Most Retro-Skiers learned to ski using the Arlberg method that Schneider started. His grandson Christoph was there this weekend to celebrate his family’s history. The second “family” is the extended Cranmore family. That, of course, includes the Schneider family. 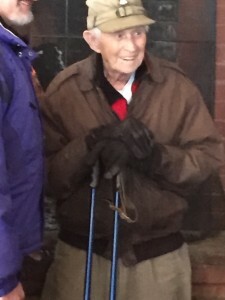 Harvey Dow Gibson who owned Cranmore arranged for Hannes Schneider to come to North Conway in 1939 and head-up the ski school. Hannes’ son Herbert would take over after his father’s death and in 1963 would buy Cranmore from the Gibson family. Herbert sold his interest in 1984, but remained a consultant and ambassador for Cranmore until his death in 2012. Then there is the Carroll Reed family. 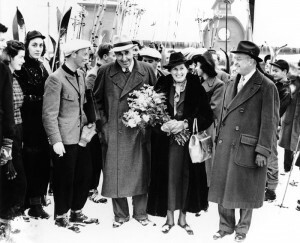 Reed started the ski school at Cranmore which Hannes Schneider would take over. Stefi Reed Hastings, Carrol Reed’s daughter, was there this weekend and gave the historical lecture on Sunday. 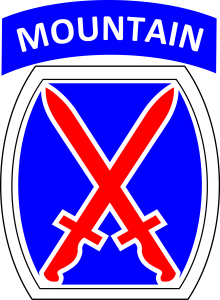 The third “family” represented is the 10th Mountain Division. It’s not just the few left from the original World War II 10th Mountain, but it’s also those who have served in the 10th Mountain since that time. Some of those veterans do ski, but many do not. They still come to celebrate their history and honor those who served. The honor guard for the opening ceremonies comes from Fort Drum in New York, where the 10th Mountain is now headquartered. The guest of ho nor at this year’ Meister Cup was 100-year-young, 10th Mountain Division veteran Nelson Bennett. I’ve written about Nelson’s many contributions to skiing in past columns. Nelson now lives in Washington state, but has attended all 19 of the Meister Cup events. For years he won the 90+ age group which he lobbied to create. He’s not skiing anymore, but he was very visible throughout the weekend and was definitely the center of attention. Normally Nelson and his travelling companion, Madi Springer-Miller Kraus, make a visit to Stowe after the Meister Cup, but this year they have to hurry to Sun Valley where Nelson is honorary head of a race held there next weekend! The Hannes Schneider Meister Cup is organized by the New England Ski Museum as one of its fund raisers. They are to be complimented for organizing a great event that is fun whether you’re a racer, a ski historian, or a veteran.